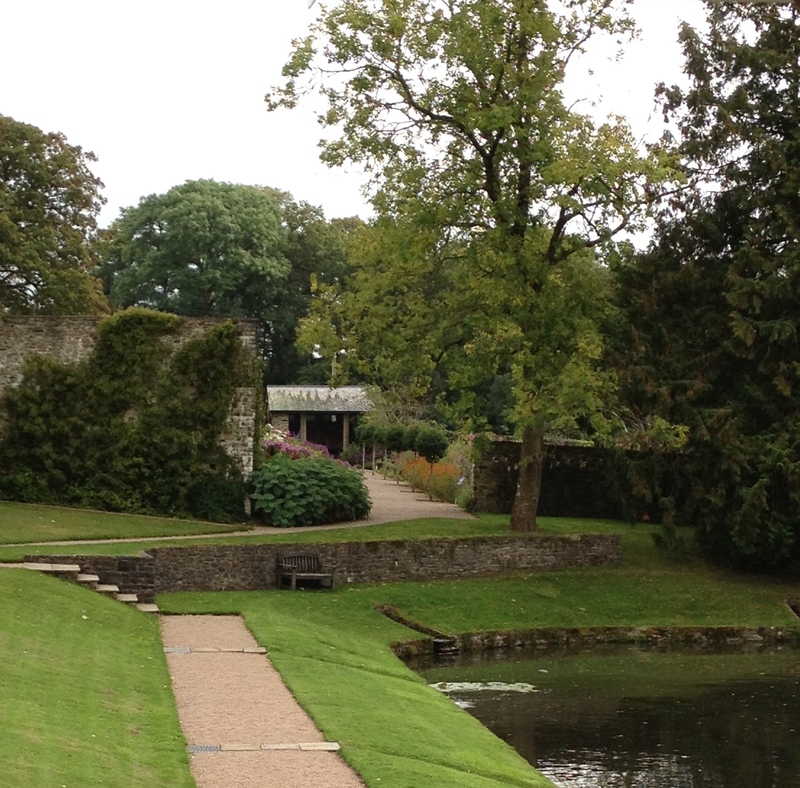 I lost my heart at Aberglasney Garden! 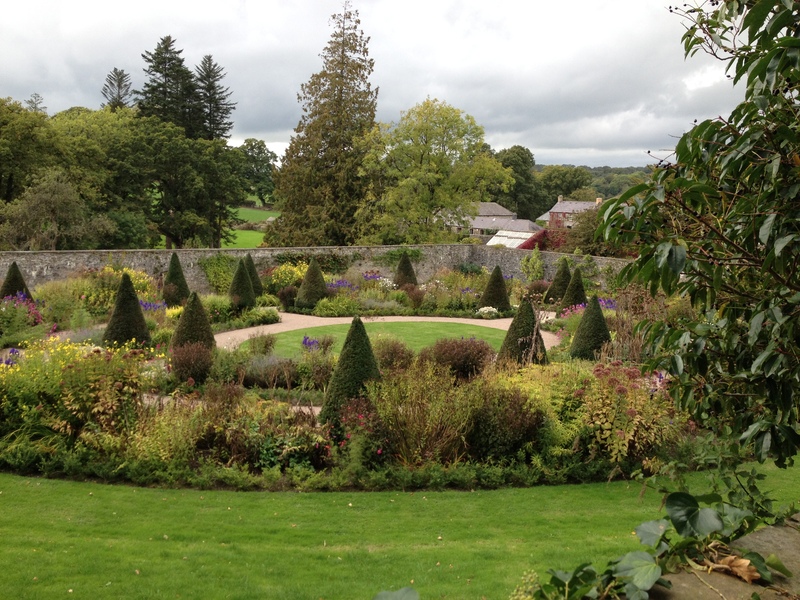 Aberglasney Garden in the Tywi valley of Carmarthenshire is rapidly becoming my favorite garden to visit. I first visited in October 2014 and was bowled over by the brilliant plant combinations and formal and informal elements of the design. 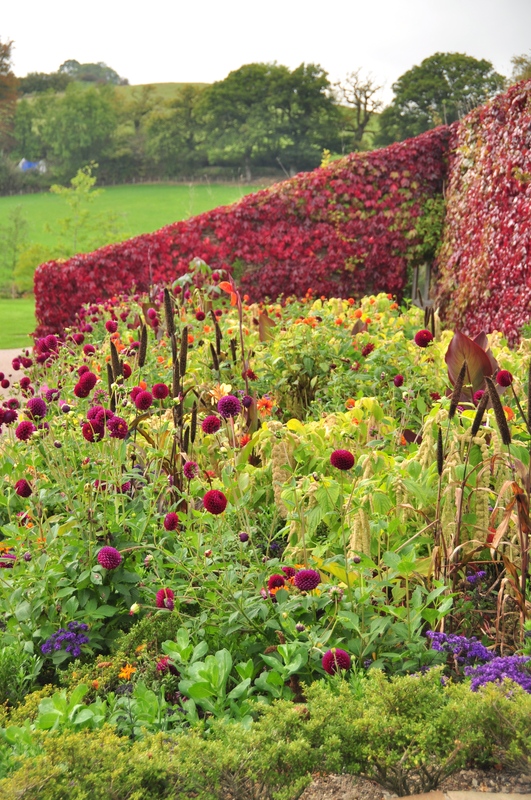 Take this wall: clothed in virginia creeper, for example, perfectly complemented by the deep red dahlias in the foreground bedding scheme. or the perfect placing of this architectural honey bush, Melianthus major, at the left side of the entrance to the walled garden. 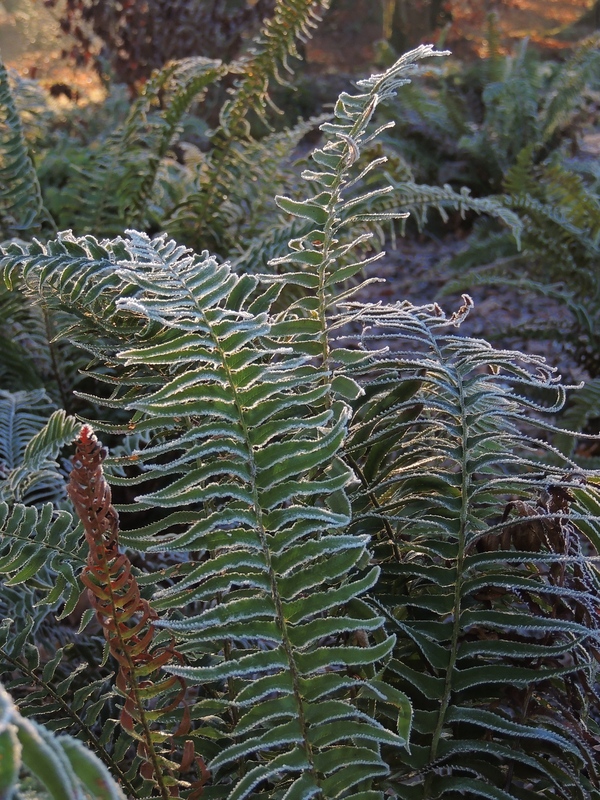 It is often said that good planting structure is best illustrated in black and white photography but the same may be said of a winter garden. 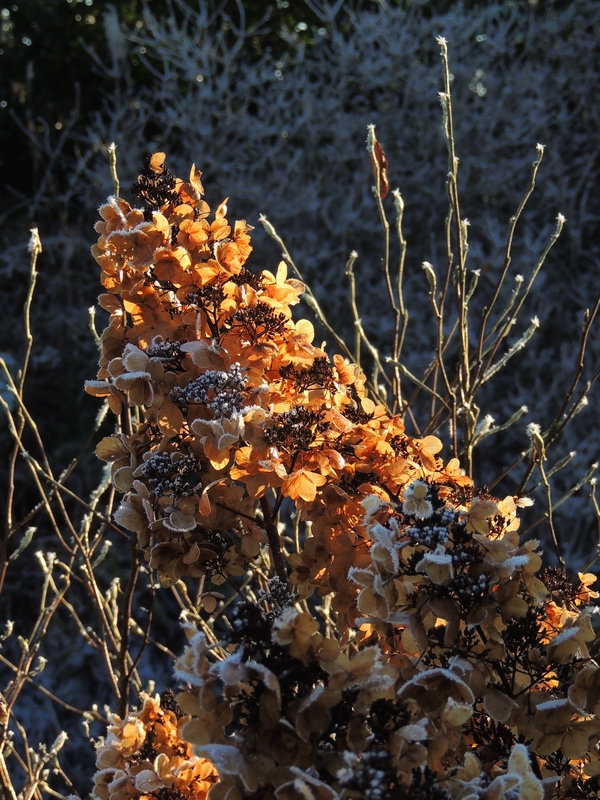 If structure works well in the depths of winter when the garden is stripped of its perennials and deciduous leaves, chances are this structure will uphold well throughout the year. So it was with great excitement I had the chance to visit Aberglasney again on a frosty day in late December recently. I was not disappointed! The yew cones in the walled garden: while in autumn they provide a supporting structure and rhythm to the flurry of late perennials, in winter they are exposed to reveal their majestic essence and purpose. 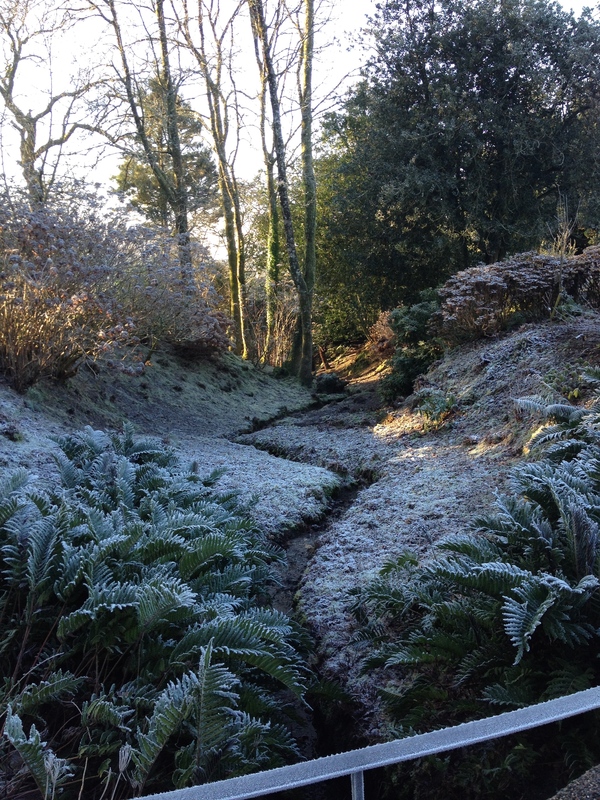 Frosted ferns provide foreground interest while the eye is led along a brook into the elegant trees beyond. 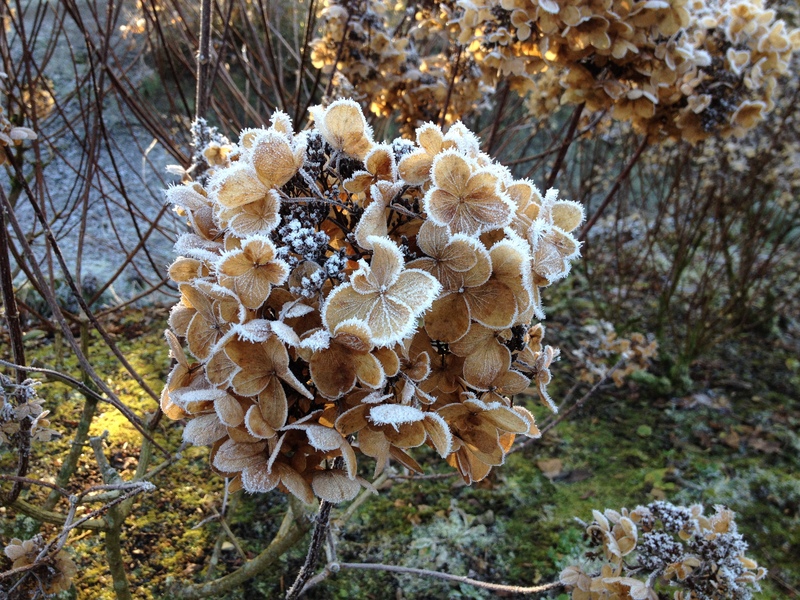 Here the flamboyant hydrangea flowers of autumn have turned to rich decorative sculptures lit by the winter sun. 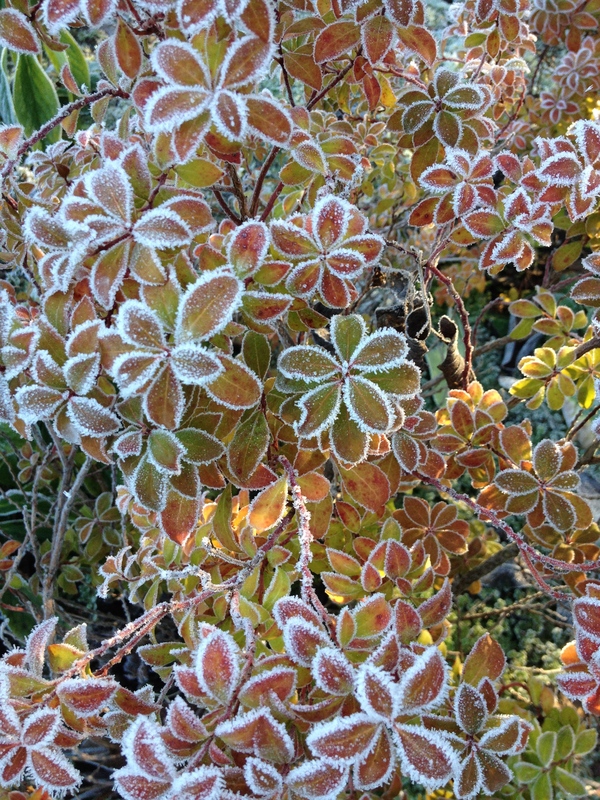 The effect of frost on plants is one of winter’s irresistible treats. Roll on spring, I will definitely be back at Aberglasney! from Urbis (urbisdesign.co.uk) is planted up with plants from The Waterside Nursery (waterside nursery.co.uk) who do pond plant kits for small ponds to make ordering easier. I planted the garden a year ago and the pond has just been added to complete the picture. 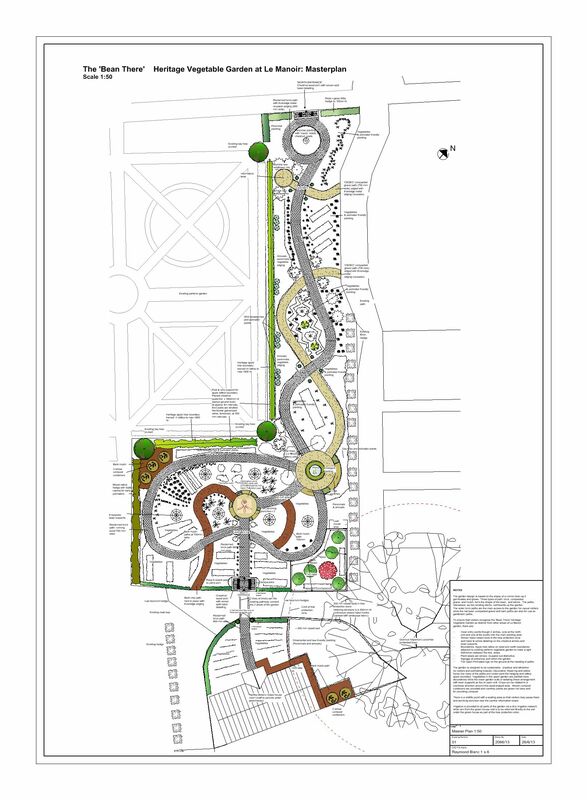 I am very pleased to have been shortlisted for the Raymond Blanc National Heritage Garden Design competition. Then get out the glyphosate and seek and destroy the Spanish one!..I love almost all things Spanish, honest, just not the Spanish Bluebell which looks, and is, thuggish in comparison. 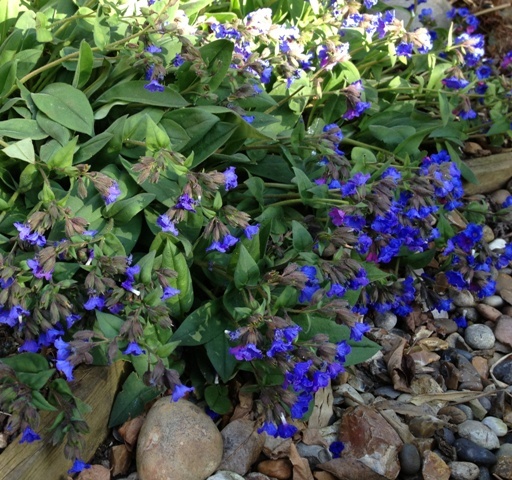 Now I’ve had my rant..back to seasonal blues: An early spring blue which is now just about over is the brilliant ground cover, front of border, Pulmonaria ‘Blue Ensign’. 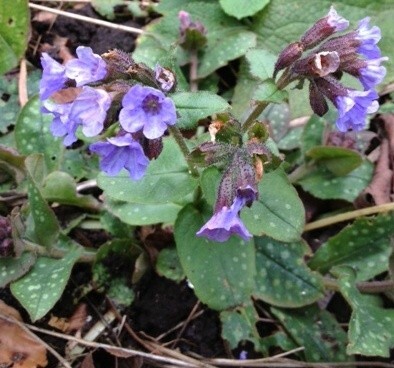 It is a lungwort but unusually does not have the spotted leaves of the wild one. 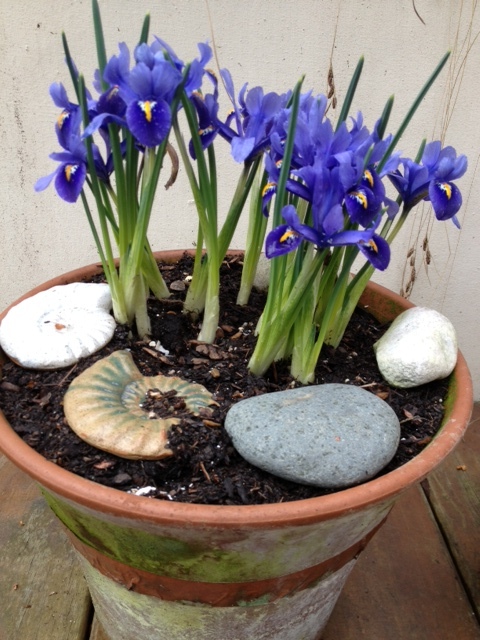 The flowers are an intense electric blue, wonderful with yellow daffodils. 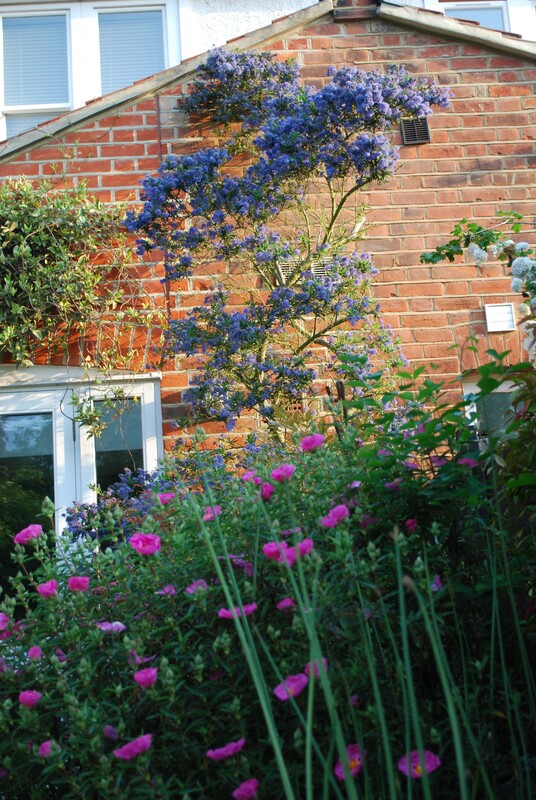 Ceanothus is now having its moment. 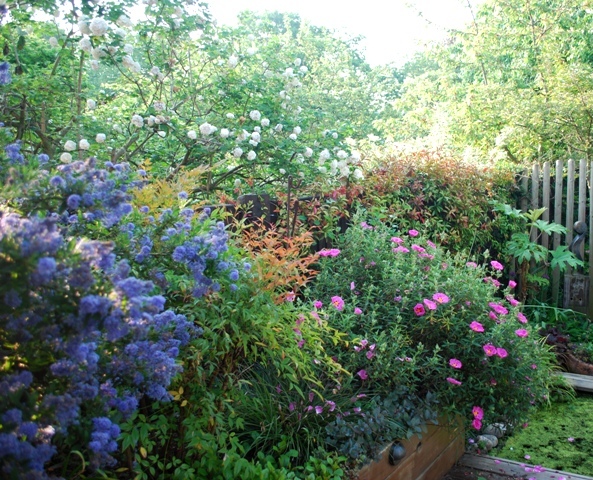 In particular the deep rich blue of Ceanothus concha and the huge C. arboreus ‘Trewithen Blue’ which rapidly grows into a tree if you turn your back (the word ‘arboreus ‘ in its name is the key) and C.thysiflorus ‘Skylark’ . 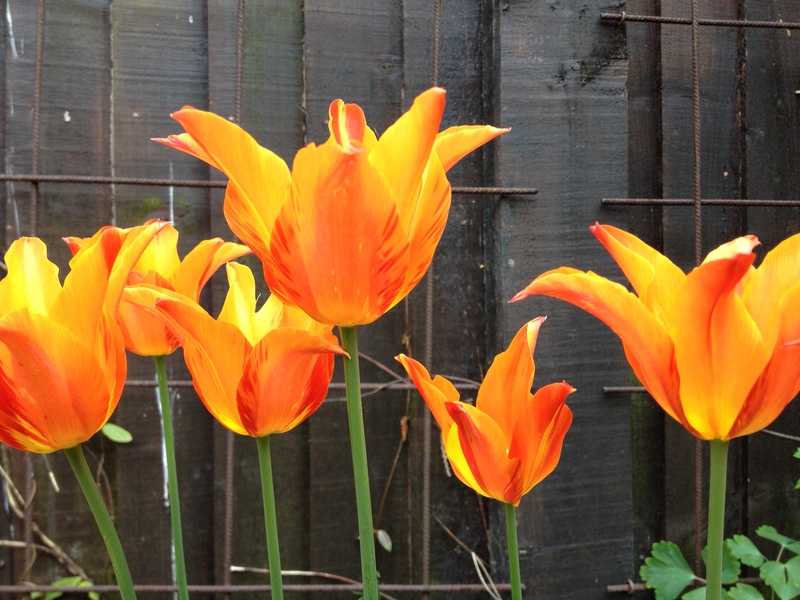 They hang over the walls of front gardens grabbing attention for a few, all too brief, weeks. People stop and stare almost in disbelief that nature can produce such an intense colour blue! 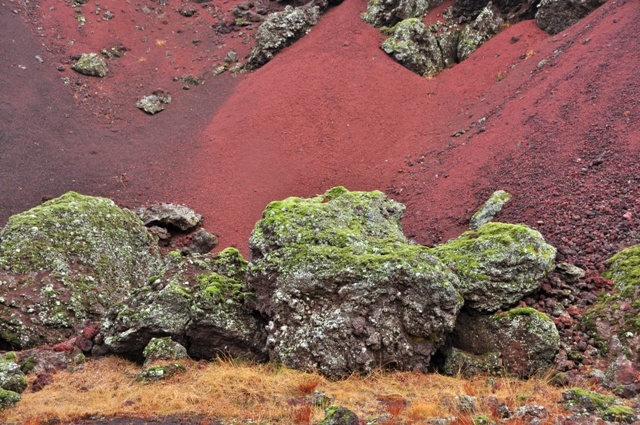 Iceland may not seem the most obvious place to take inspiration for garden design, especially in winter, but inspirations for artists and designers come from diverse &, sometimes unlikely, places. 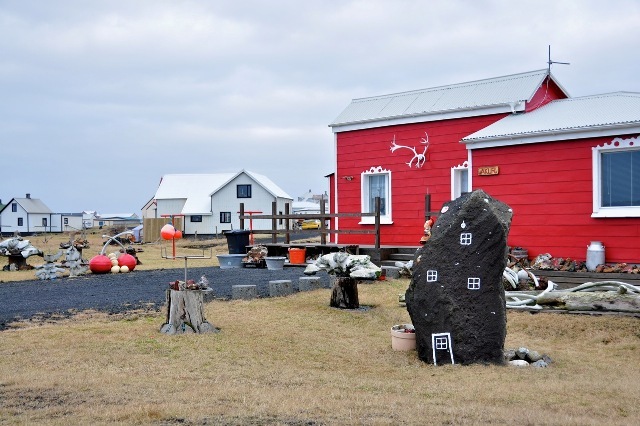 Although Iceland is warmed by the Gulf Stream, it is still at a latitude of 64.8 o N, and with the wind chill it can be very cold (when I was there in late February on some days it was down to approx – 6 o C which was -20 o C with the bitter wind chill factor). 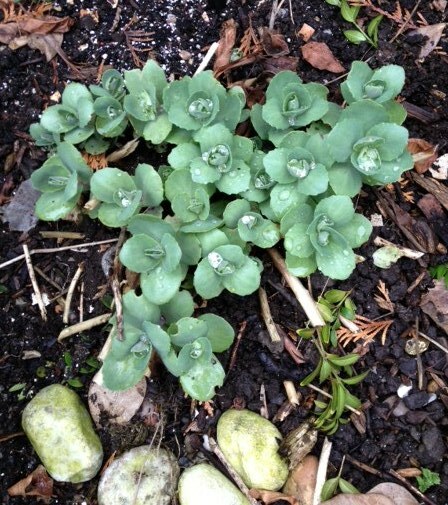 The cold winter temperatures and often cool summer, strong winds and thin soils do make cultivating plants & gardening there challenging. 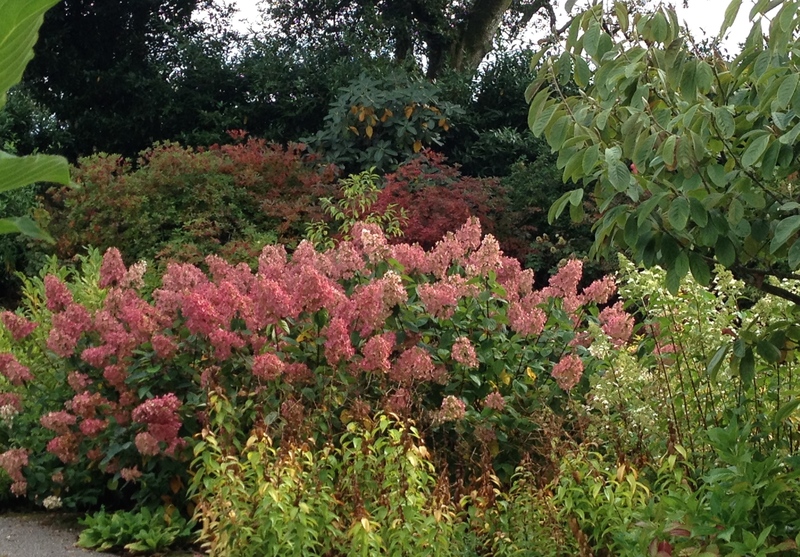 However, as Cleve West recently pointed out (in ‘into Gardens’, Winter 2013) when he journeyed there in September last year, perhaps with such a stunning and ever erupting landscape, garden design becomes irrelevant. Here I am not aiming to show that I know whether this is true or not, as I think garden design always has a place, nor to set myself up as an authority on Icelandic plants, design or anything more than a passing tourist with an artist’s eye. I offer you some strange and wonderful and quirky sights. 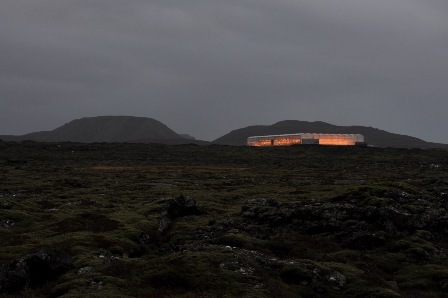 Like a friendly radio tuner offering warmth in the encroaching dark, this glowing slab is one of the glass houses where salads are grown. Most vegetables have to be imported. 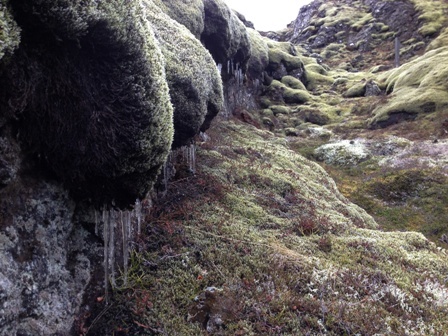 No, this isn’t in Iceland! 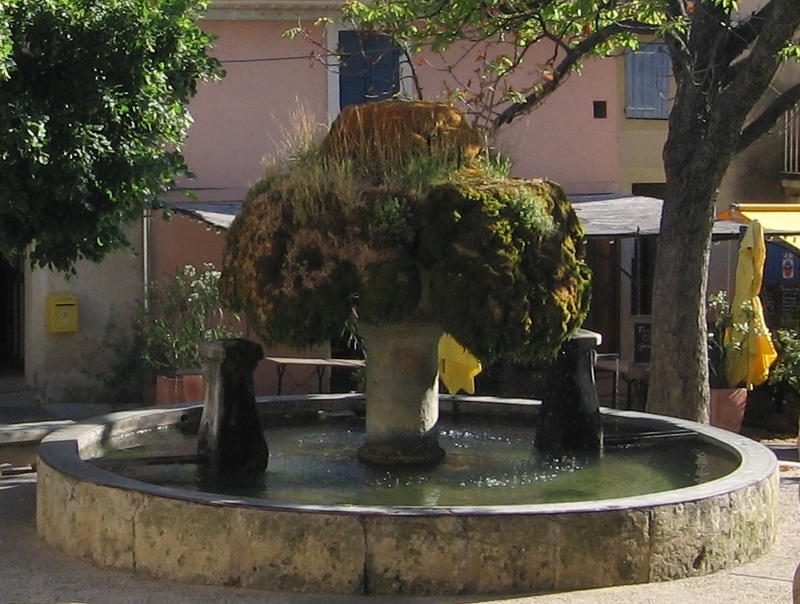 It’s a moss fountain I once saw in Provence. Inspirations can travel far. 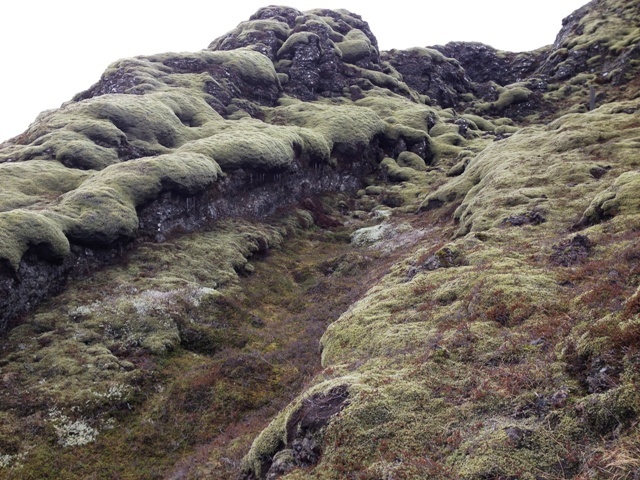 The following images were taken on Snaefellsnes peninsula. A stunning and desolate place in winter. 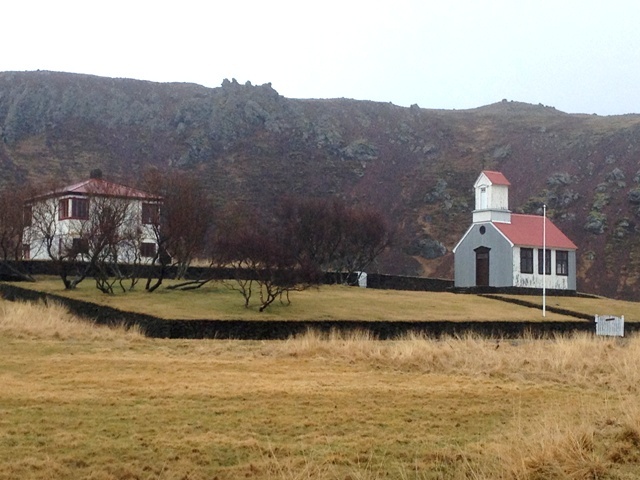 The ‘garden’ of this church is on a raised volcanic stone wall. Maybe to increase or create soil depth or to give the church prominence. There is no shelter, certainly. The landscape is largely treeless (cut down many years ago by humans) although attempts to replant are now being made. 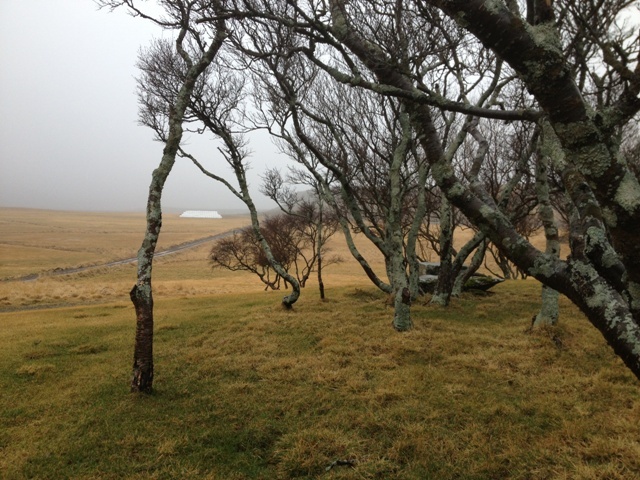 Treeless landscapes are often hard to scale. 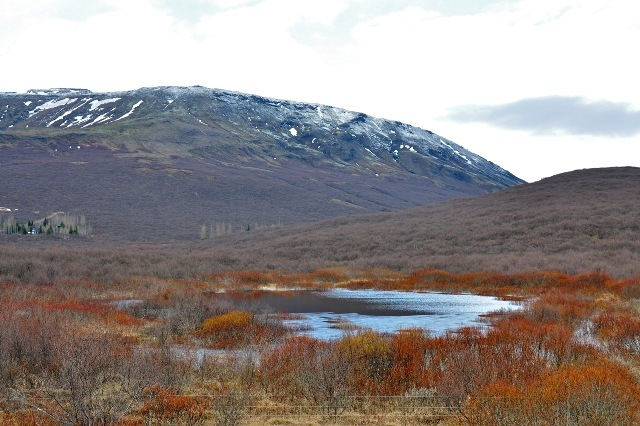 These birches, which are generally more stunted than English ones, are an unusual and welcome sight. 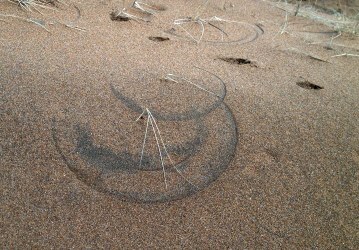 Willow stems colour the rim of the frozen pool. Purple stems of shrubs on mountain behind. 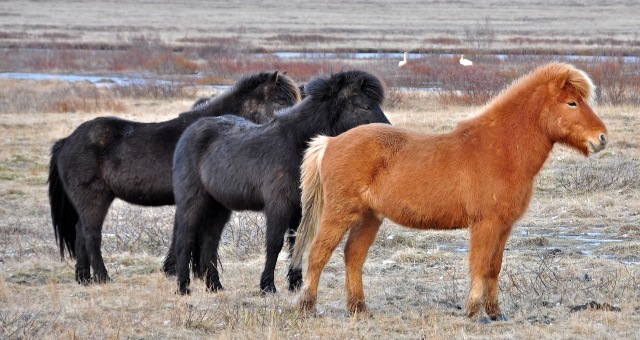 The Icelandic horse seems to issue from the landscape Horses ..made of lava and willow stems? 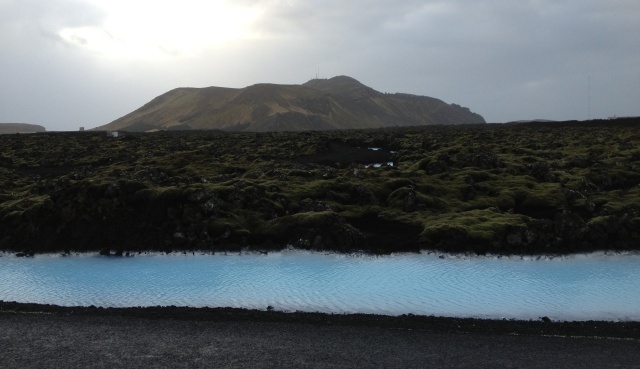 Never think of the Icelandic landscape as colourless. Hellnar Church (above). 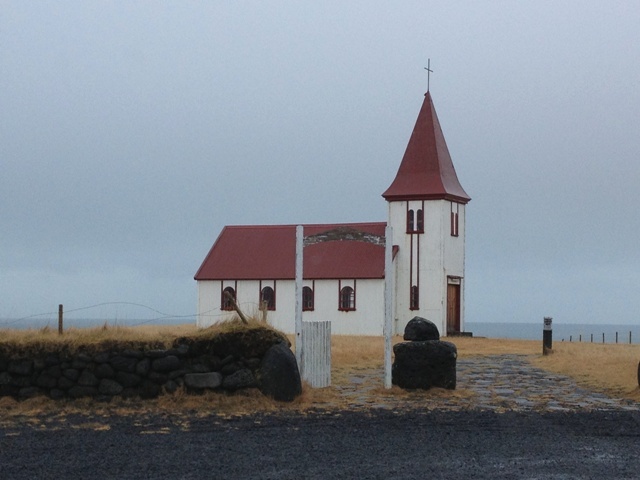 A lonely little church right on the clifftop. I love this simple but pointless gateway with the massive gatepost and wayward barbed wire. 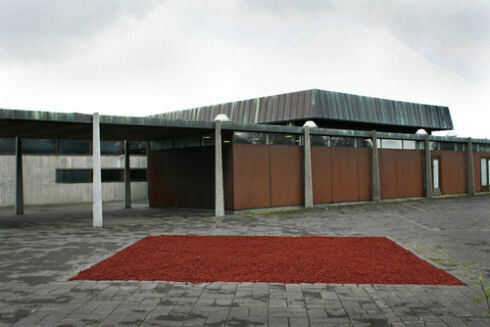 Lava roundabout (below) : simple but effective and very low maintenance! 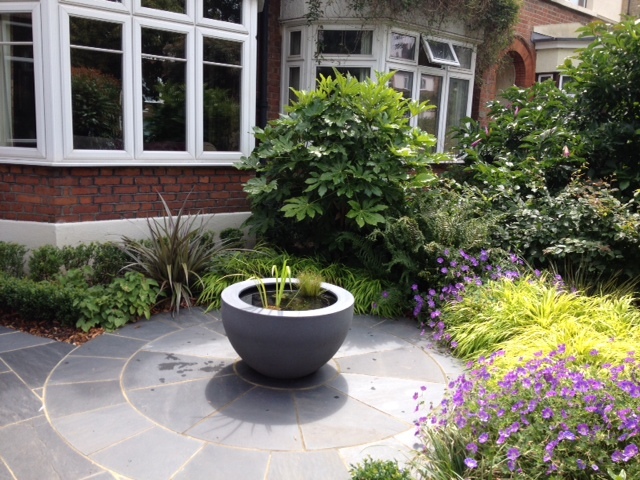 Black is an under-used colour in garden design. 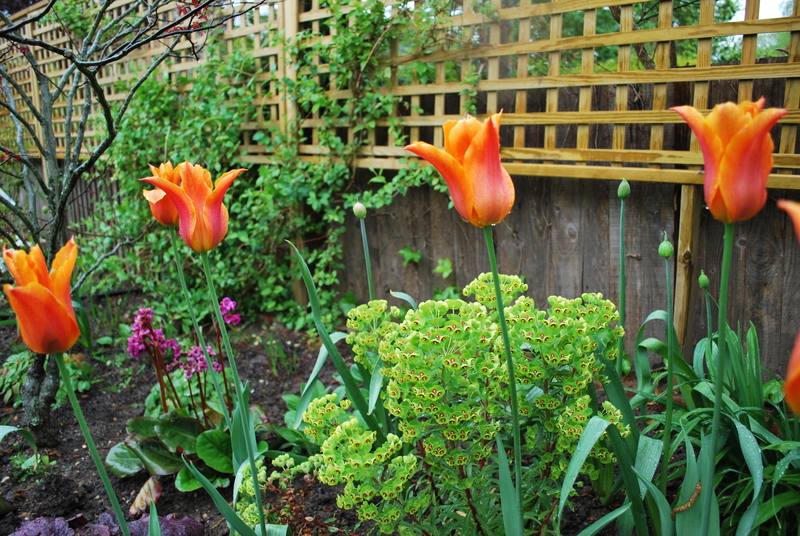 This would be amazing with planting of orange flowers eg. Geum Prinses Juliana, or Eschscholzia . 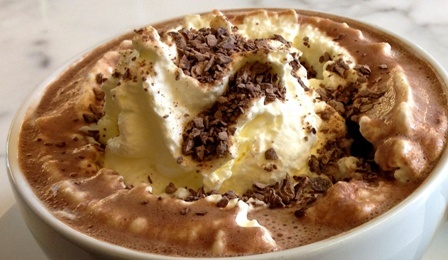 Icelandic hot chocolate really is the best! 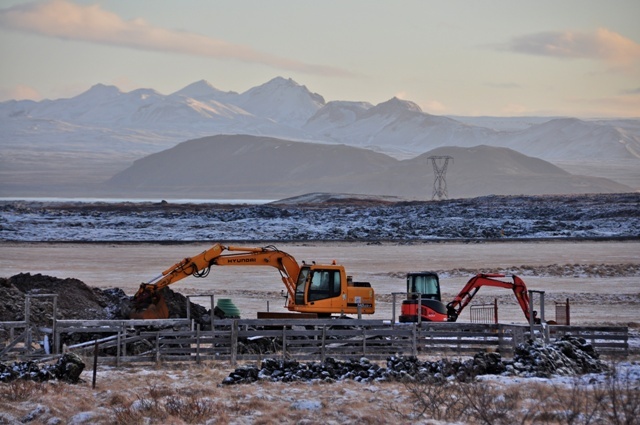 Landscaping on a mountain top, near Nesjavellir, courtesy of the geothermal energy company. 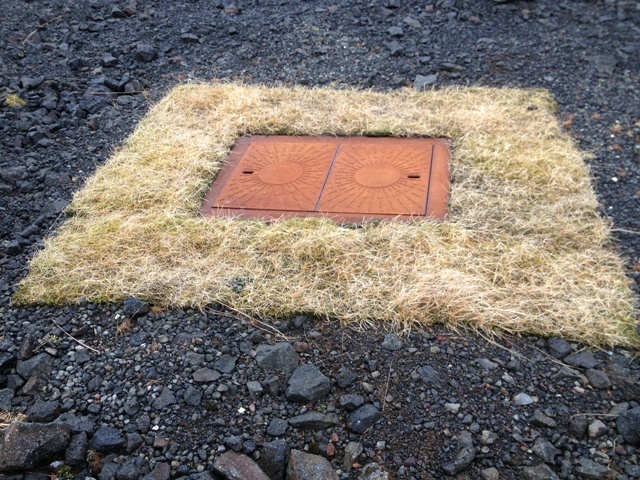 Nice use of Corten steel, sunburst design logo and clever use of real grass laid directly on lava chippings. Hmm. Could be up for an award? (Below) A blue lagoon sandwich or is that the sky? Water features often serve to reflect the sky but in this case the water really is that colour due to the minerals in the power plant outflow and blue green algae. Lovely and warm for bathing in. 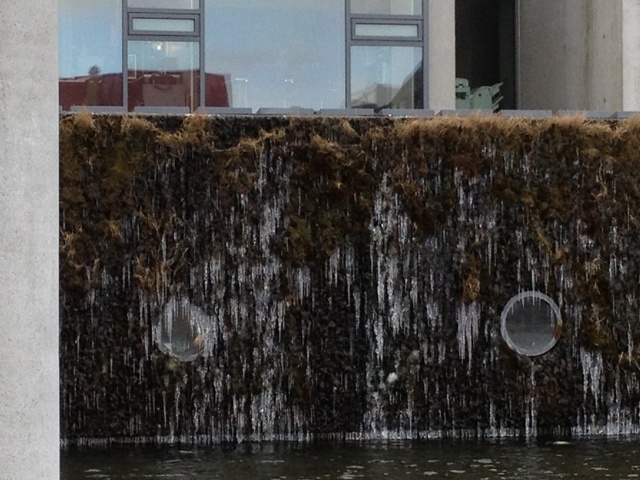 In Rekjavik: a frozen green wall. Wonder what it will look like next summer. 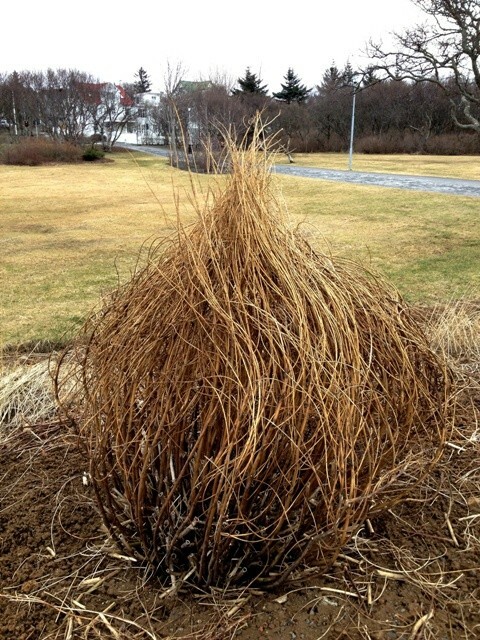 Has this parkland shrub been coiffured or is it natural?! 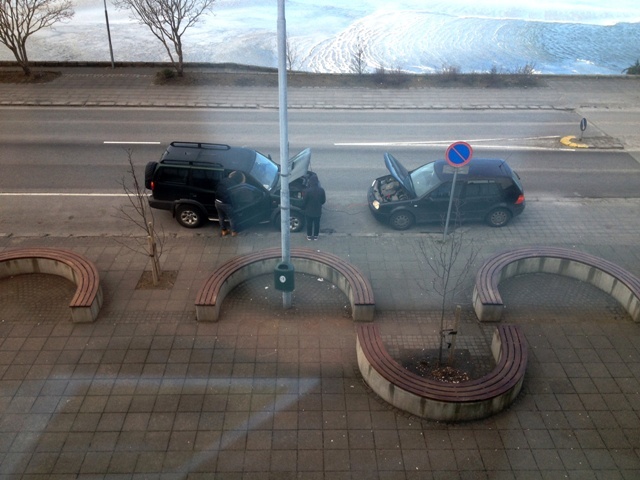 Reykjavik : A frozen lake, a flat battery, and some serpentine seats for.. when summer comes. 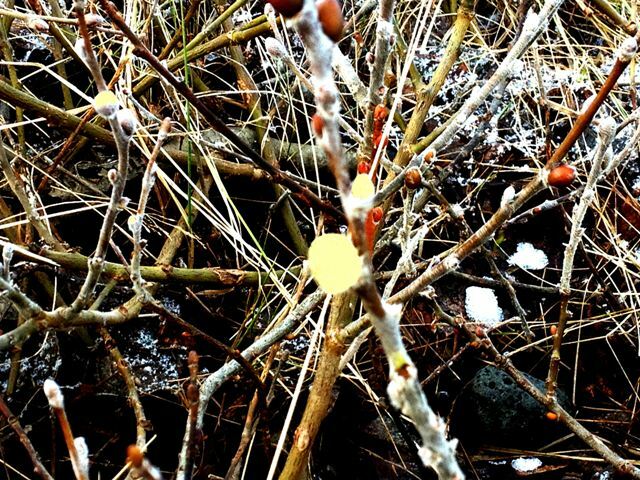 It’s time to cut down those Cornus (dogwood) stems that have been glowing red/green or orange all winter and bring them inside so you can extend enjoyment of them, while allowing new growth buds to form outside. 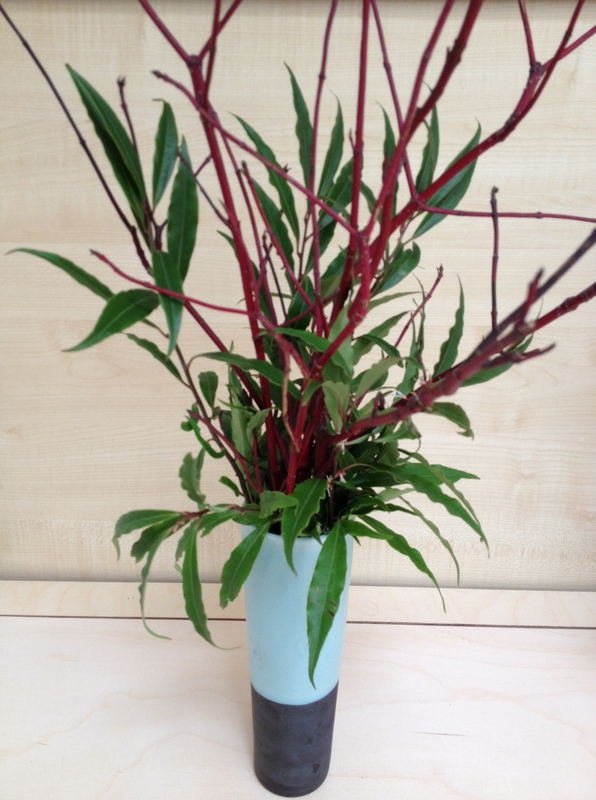 If you cut only a third or half of the stems you can still have flowers this year and get coloured stems next winter from the new ones. Preferably place them in a turquoise pot so the colours can zing with each other! 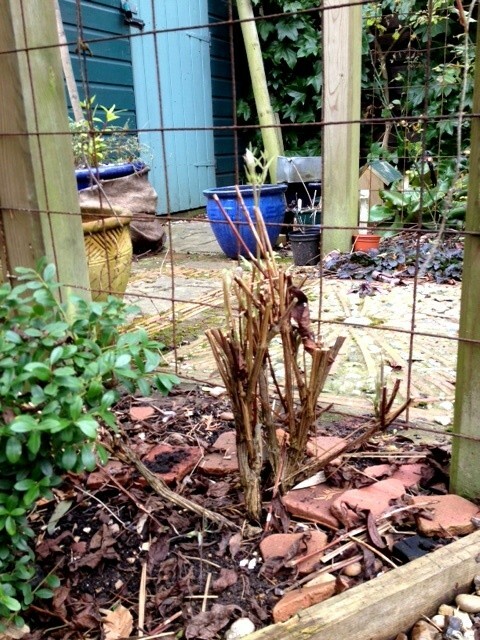 Summer flowering clematis should generally be pruned at about 30cm height now (but check which pruning group yours belong to first). 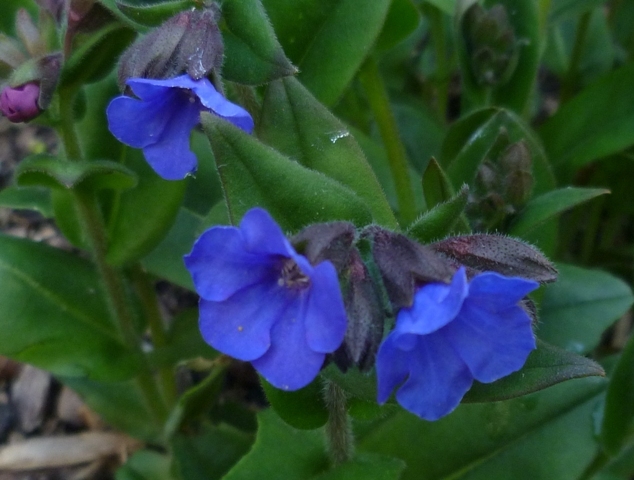 Other plants that are great right now apart from daffodils & snowdrops are the Pulmonarias (lungwort) and tiny reticulate irises . And lastly the frogs have already started their activity in our pond (don’t they realize we only have room for 4 pairs?!!) 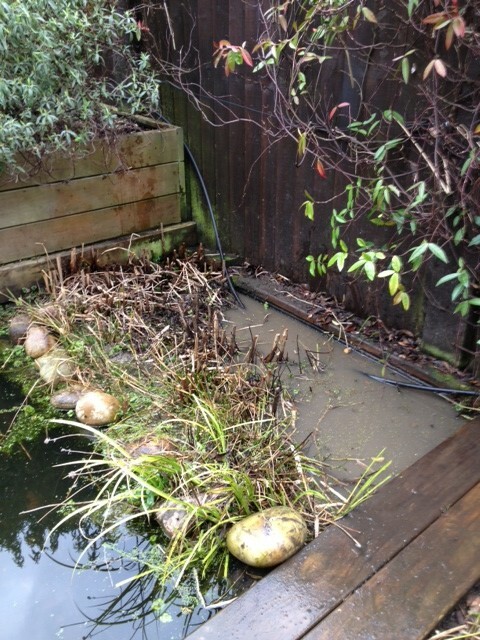 so if you have a bog garden or pond that needs cleaning out or cutting back this may be your last chance to avoid disturbing wildlife. Britain’s biggest water company is lifting its ‘hosepipe ban’ today, 14th June, after an extraordinary amount of rain eased the severity of the water shortage in the South and East. Thames Water said “a heartfelt thank you” to the 8.8m people it supplies across London and the Thames Valley for complying with the Temporary Use Ban, helping save more than 100 million litres a day during the hot spell in May. But with the possibility of a third dry winter in a row this year, the firm urged its customers to continue to use water wisely, reiterating its offer of free water-saving devices that can be ordered on the company website. Hosepipe bans were imposed on April 5 by Thames Water and six other firms following the driest two-year period on record. But within hours the heavens opened and stayed open, delivering more than two-and-a-half times the average rainfall in April, steady showers in May and further monsoon-style downpours so far in June with more forecast. 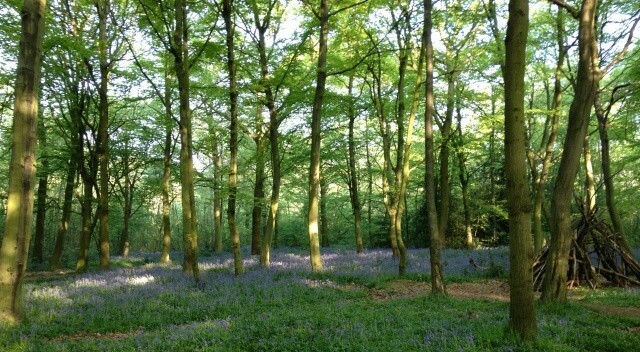 Although the record spring rain has enabled Thames Water to fill up its reservoirs, water levels in the natural storage basins deep underground remain low. At this stage of the year, with plants and trees growing and sucking up much of the moisture, groundwater levels are not expected to recover fully until there is sustained winter rainfall that seeps deep into the ground. “We would like to say a heartfelt ‘thank you’ to all our customers for complying with the restrictions, and for their ongoing efforts to use water wisely. They really are much appreciated. “In early April things looked very different than they do now. We had had the two driest years on record and we had no idea how long it was going to stay dry. “While we prepared for worst, bringing in restrictions to save water to ensure there would be enough if the dry spell continued, the topsy-turvy British weather had other ideas. 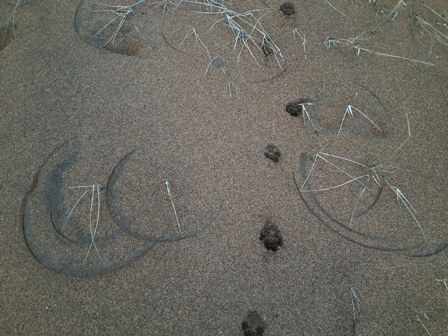 “Since we imposed the Temporary Use Ban just over two months ago, we have received an extraordinary amount of rain. “We are really pleased we can now lift the ban but, with groundwater levels still low and the possibility of a third successive dry winter, we still need to be careful. We don’t need a ban, but we do need to ask everyone to keep on using water wisely. In addition to the 100m litres of water a day saved by Thames Water customers adhering to the ban, the company is also 60m litres a day below its regulator-agreed leakage-reduction target for this year. This has saved about 6% of the 2.6bn litres of water a day that the company supplies. Earlier this week the company announced it had hit its sixth successive annual leak-cutting goal. By replacing 1,600 miles of old pipes the firm has cut leakage from its 20,000-mile network by more than a third since its peak in 2004. Thames Water’s ban will end at 0001 on Thursday. Southern Water and Anglian Water are also expected to lift their Temporary Use Bans. Meanwhile the other four companies, which are more heavily reliant on groundwater supplies, are expected to need to keep their restrictions in place for longer.